It achieved the purpose that tea does not fall to the ground in the system by arranging reasonable each tea-processing machine and making conveyors as perfect as possible. All areas that directly or indirectly contacting with tea, are made of clean materials such as high quality stainless steel, conveyor belt and so on. Using organic material reduces the noise pollution of cylinders in this Producttion line. 4.Taking measures to prevent air pollution caused by tea dust which released from tea-processing machine. It use humidity-discharging device in roasting machine and tea dryer to exhaust fume out in order to avoid tea dust polluting in the workhouse. This Producttion line makes good use of non-contact type infrared to measure the temperature of the rotary tea-processing machine. Applying the technology of frequency conversion and speed adjustment, this Producttion line makes our tea-processing machinery meet different technical requirements of different tea. However, all equipments can start, run, and stop smoothly. This Producttion line automatic control system is composed of industry computer (PLC). Operator can preset the technical parameter of rotary fixing machine, rotary cooling machine, roller, dryer, rotary roasting machine according to the parameter of fresh leaves and dry tea, and then this Producttion line can run automatically without people action. 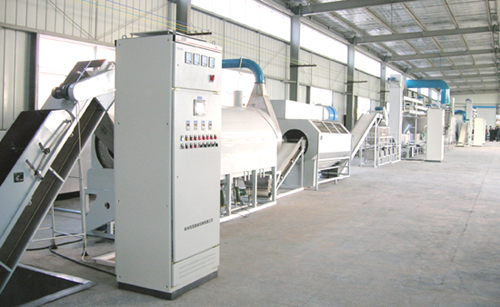 It is an ideal tea-processing Producttion line used in the organic tea .